I’ve had the pleasure of knowing Rinpoche a bit over the years, and always found him in good cheer. This meeting was no different. When I called him at his Manhattan hotel to arrange to get together before we were to discuss his new book, “Joyful Wisdom” at the 92nd St. Y, he told me he was in the middle of a shower — but not in the usual sense. The shower, he told me, had run out of hot water midway. When he called the front desk, he was told to wait several minutes and there would be more hot water. In this situation, I probably would have been peeved. But as Rinpoche told me this, he was laughing and laughing. But when it comes to his own pursuit of happiness, Buddhist theory and practice are Rinpoche’s chosen tools. He has done several years-long meditation retreats, under the tutelage of some of the most renowned Tibetan masters. Of course, what we mean by “happiness” can be elusive, what with the myriad varieties of good feeling running from ecstasy to equanimity. 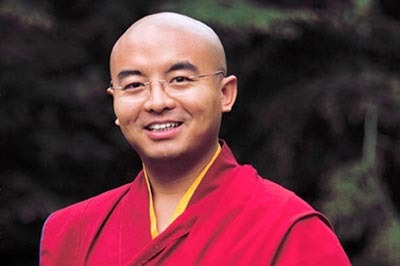 One flavour of happiness at which Rinpoche seems to excel has been well-studied by scientists specialising in how emotions operate in our brains. One of the first findings from the research showed that when these adepts meditated on compassion, their right prefrontal areas jumped in activity an average 100 percent — by contrast a control group who were taught the same meditation practice showed an increase of just 10 percent. Two of the adepts had spectacular increases, in the 700-to-800-percent range, in key neural zones for good feeling. The more lifetime hours of practice, the greater the increases tended to be. All this seems to confirm the idea that in the realm of positive moods, as in nearly every endeavour, worldly or spiritual, practice matters. Davidson worked with Jon Kabat-Zinn, a teacher of mindfulness meditation from the University of Massachusetts Medical Centre, to see how a group of novices might gain from these methods. Kabat-Zinn, who has pioneered this contemplative method with medical patients to ease their symptoms, taught mindfulness at a high-stress biotech company; these beginners meditated for 30 minutes a day for eight weeks. Davidson’s measures showed that after the eight weeks they had begun to activate that left prefrontal zone more strongly — and were saying that instead of feeling overwhelmed and hassled, they were enjoying their work. So while the Calvinist strain in American culture may look askance at someone sitting quietly in meditation, this kind of “doing nothing” seems to do something remarkable after all.